The formation of a rifle corps at the General Post Office in London was sanctioned by the War Office in February 1868. Designated as the 49th Middlesex Rifle Volunteer Corps, the 49th consisted of seven companies and was recruited from the minor staff of the Post Office. At this time, senior members were already serving as part of the 21st (Civil Service) Corps. The 49th became the 24th in 1880 and the following year joined the Rifle Brigade as one of its volunteer battalions. In 1882 a scheme was approved for the formation from within the 24th of an Army Postal Service. The idea of the new unit was for it to undertake all postal duties connected with an army on active service overseas. The Army Post Office Corps was formed and in 1882 joined the Expeditionary Force in Egypt. The 24th were subsequently awarded the battle honour ‘Egypt 1882’, making the Post Office Rifles the only territorial battalion to be thus honoured. Members of the battalion also served in South Africa during the Boer War. 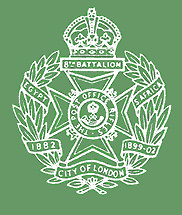 In 1908 the 24th became the 8th (City of London) Battalion, the London Regiment, and as such fought throughout France and Belgium during the First World War. In 1916 the 24th became part of the Corps of the Rifle Brigade and in 1922 was amalgamated with the 7th London Regiment.